Be Nice to Yourself! 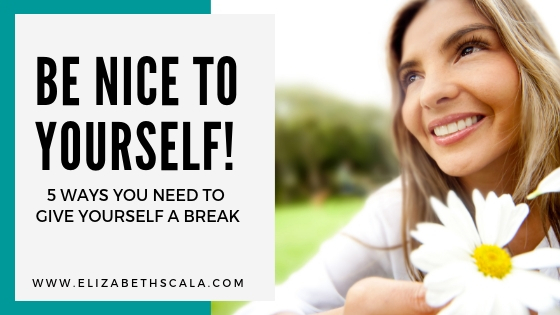 Give Yourself a Break. I often wonder if it’s because I am a nurse that I beat myself up. Or, maybe it is because I’m a woman? Furthermore, could something have happened early on in my life that makes me critical, judging every little thing that I do? Pulse check. Are you nice to yourself? Be honest. I mean, think about it honestly. Are you kind to you? If you make a mistake, receive a rejection letter, or get turned down from a position – what are your initial reactions? Being Nice Takes Time, Practice, & Patience. Trust me. I am still a work in progress. I think that when we set out to achieve certain goals that it is only normal to feel beaten to the ground when things don’t go the way that we envisioned them to. I can say that with time, practice, and a lot of patience – you can do better at being kind to yourself. In fact, over the past few years, I honestly have made slow, yet steady strides in this department. 5 Ways to Give Yourself a Break. 1) Remain Objective. When the “thing” that you are disappointed by is work-related, try to remain as objective as possible. This is definitely easier said than done, especially for the “sensitive types” like me… but professional activities are best managed when we can avoid getting emotional. Sure, it will sting at first. But rather than digging a hole and burying your head in the ground, stay objective and focused. Ask yourself, how can I make the manuscript better? Is there a journal out there that would be a better fit? What feedback did the reviewers/editor provide that I can learn from? Get yourself back out there and resubmit the work to another journal! You never know… the second time around the manuscript may sail smoothly through the review process! 2) Let it Go. In my signature book/talk, Nursing from Within, I share four steps for re-energizing your nursing career. The second step in the process is entitled “let it go”. Again, easier to talk about than to put into practice. But, at least with this step there are loads of options available to you! How might you support yourself in letting go? You may try journaling. Writing down all of the things that are bothering you and purging the nasty onto the paper. Or, you may consider getting up and moving. A walk, jog, or even some dance movements can move the physical stuck energy out of the body. Other ides for letting go include: getting a massage, crying it out, holding a ceremonial burning, or making a list of your accomplishments. Another one of my favorites is what I call a “rant window of time”. What’s this? Well, often in nursing there are times when we just have to vent. And harping on this negative vent session for too long can be counterproductive, even bad for you! But, allowing yourself a rant window of time can help you get the vent out and then support you in moving on in a timely fashion. 3) It’s Not You. It’s Me. Sometimes, the situation that you are beating yourself up for really isn’t even about you! As they say, it takes two to tango. And, bringing in a holistic perspective, let’s make that three to the dance. What do I mean by that? Well, sure you have the other person, yourself, and then you also have the energy between the two of you. Let’s take another example with this one. You’re having issues with a particular physician at work. She doesn’t always greet you when she comes onto the unit. She isn’t fast to respond to your pages in the middle of the night. You’re likely thinking, gosh… what the heck is wrong with me? Why doesn’t this doctor like me? Guess what!? The physician may not even be aware of their actions towards you! Maybe she is distracted when she gets to work because she just had to drop her two-year-old off at day care and the process never goes well. Maybe she is overwhelmed by her sheer work flow on night shift that she doesn’t prioritize returning calls as she should. You never can know what is going on with another human being. Unless you ask them. Rather than thinking that you’re invisible or disliked, drum up a casual conversation out of sheer curiosity. Lead with questions and remain objective as you inquire. Talk to people rather than assuming you know what they are thinking and why they are acting a certain way. 4) You Are an Awesome Human. That’s right. I said it. Now, it’s up to you to believe it. We ALL make mistakes. Each one of us has shortcomings. I’m not 100% sure, but I really think that there isn’t a single person out there that is perfect. Sure, we all want to present the image that we are as close to put-together as we can possibly be. But, if you fall down… the very best thing that you can do for yourself? Here’s an example. I made a mistake at work with some study files. The tops of the documents got cut off incorrectly and the lead site study team could not use them. I went back into work the next day and owned up to the issue. I apologized to the people that the work harmed. I fixed the error as best I could. And I made certain that I would never do something like that again. Acknowledge that you will make mistakes and realize that it is not the end of the world. 5) Switch Your Viewpoint. Instead of beating yourself up over something that didn’t quite go your way, why not shift your perspective? This is probably my favorite tip. Because, to me, it is the easiest one! All you have to do? Focus on the positive. Rather than harp on what you did wrong, look for ways to grow. Instead of feeling sad by a rejection, feel glad that you even had the opportunity to have try the experience! You are good – no great – in SO many ways!! Whenever life’s got you down, take the good fortune handed to you and list out all of the ways you are wonderful. By focusing on the positive, it makes it that much easier to handle life stressors that will always be coming your way. Would love to hear your thoughts on the above list and what you’d add to the docket? Tell us by commenting below, how do you practice being kind to yourself? About the Author: Keynote speaker and podcaster, Elizabeth Scala MSN/MBA, RN, HNB-BC partners with hospitals, nursing schools, and nurse associations to transform the field of nursing from the inside out. As the host of the Your Next Shift podcast, Elizabeth supports nursing organizations in celebrating and recognizing their staff in a meaningful way. Elizabeth received her dual master’s degree from Johns Hopkins University. She is also a certified coach and Reiki Master Teacher. Elizabeth lives in Maryland with her supportive husband and playful pit bull.